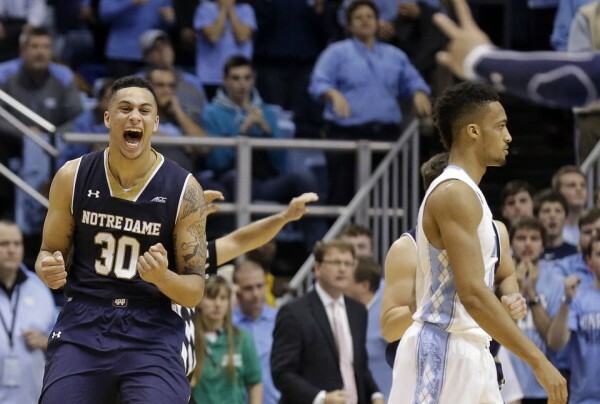 People are starting to realize that Notre Dame and their four guard lineup is more than just a gimmick, pulling off a 71-70 win against North Carolina with a Zach Auguste layup to win the game, although the Tar Heels had plenty of opportunities to seal the deal. Notre Dame open their ACC season at 3-0 while handing North Carolina, who paid tribute to Stuart Scott before and during the game, their first conference loss of the season. After Auguste hit the layup with 1:08 left in the game, the Tar Heels missed four consecutive shots, three of them by Marcus Paige, while J.P. Tokoto kept pulling down offensive rebounds. Size does help you in some way, but making shots is still the most important part of basketball, no matter what other advantages you try and build around. Notre Dame kept UNC in the game by missing two free throws falling the flurry of misses as Steve Asturia botched the opportunity to seal the game. North Carolina still had four seconds to try and win the game, but Marcus Paige missed another 3-pointer and time ran out. Paige finished the game with 15 points on 6-of-17 from the field, but four of those misses came in the final minute of the game, also making just 2-of-8 from beyond the arc, just like his team hit 25% from there overall. And that was the difference. North Carolina tried the bigger lineup and couldn’t defend and speed and athleticism of Notre Dame. That speed wasn’t about driving to the paint and attacking the rim, but was used to get good and open shots from long range. The team leading the nation in points per possession made 43.5% of their 3-point shots, so losing the rebound battle and allowing 21 offensive rebounds didn’t hurt in the end. The team’s best player, Jerian Grant, had a bad game, scoring just 8 points on 1-of-8 from the field. But he did finish with 8 assists and just like his absence hurt the team last season, his presence makes everyone around him better and more confident. Auguste led the team with 18 points, Demetrius Jackson scored 15 and Pat Connaughton scored 15 points, hitting 4-of-7 from beyond the arc. V.J. Beachem came off the bench to score nine points, all from beyond the arc. Losses happen, but every game shows a new flaw the Tar Heels have to worry about. Casting the Kentucky game aside because everyone has been losing to them, the Tar Heels lost three games that were more than winnable – Iowa, Butler and now the Fighting Irish. After playing Louisville comes a streak of five games against unranked teams, although with North Carolina looking less than complete, it doesn’t promise them anything. Notre Dame on the other hand might find themselves rising into the top 10, and will be taken a lot more seriously from now on.